(1hdc, 2dc, 3trc, 2dc, 1hdc) in same space or stitch. Using color 1, work 24sc around elastic hair band, sl st to first sc on beginning of row. Turn. Row 4 - Join in color 2 with a sl st to any sc, * work 1sc in each of next 4st, (1sc, 2ch, 1sc) in next st, 1sc in each of nex 4st, sl st in next sc, * rpt from * to * to last 9st, work 1sc in each of next 4st, (1sc, 2ch, 1sc) in next st, 1sc in each of next 4st, sl st to first sl st on beginning of row. Fasten off. Finishing - Weave in trim any loose ends of yarn. 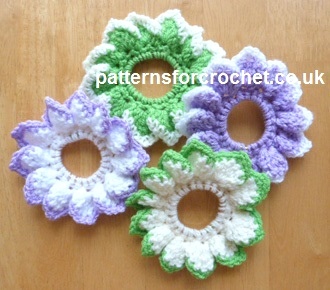 Hope you enjoy this free crochet pattern for a petal scrunchie.